I wanted to tell you about a very special plant in my yard, my banana shrub or port wine magnolia (Michelia figo). It’s my oldest plant by far. My house was built in 1850, so you'd expect the surrounding gardens to be lush and tangled, full of fine old specimens planted in bygone days, but sadly this isn’t the case. When I moved in eight years ago, my yard was nearly bare—except for the glorious banana shrub. It stands in a sunny spot at the northwest corner of the front porch. You can see it at the very back of the top picture. Let me describe my banana shrub in detail. For starters, it’s not really a shrub; it’s a small evergreen tree, about 20 feet tall and wide, with a graceful, rounded form, the canopy shaped almost like an umbrella. Virginia creeper and Spanish moss stream down from the branches, which shade a little bumpy stone path that passes underneath. The glossy green leaves are about 3 inches long. My plant has multiple trunks, each elaborately carved with sapsucker holes, rows and rows of them, from top to bottom. Now for the best part: the flowers. 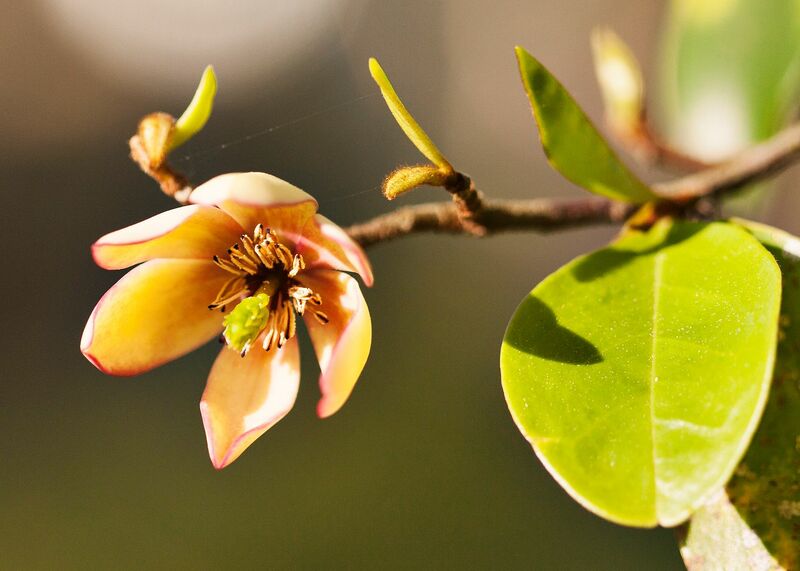 Banana shrub blooms in spring, in April, the buds encased in fuzzy brown bracts. When the flowers emerge, they're about an inch and a half wide, light yellow, the color of old wax—and with a waxy texture too. Each petal is delicately outlined in maroon. The flowers are pretty, but what they’re really known for is their scent, which can be really potent, bewitching, overpowering. My sister Bunny says they smell like “bananas and wine,” but Rob says they smell like nail polish remover. I think they smell like banana liqueur—yes, fancy banana cocktails—and, like I said, the fragrance isn't subtle; it spills out over the garden, drifting, wafting, invisible, intoxicating. Walking under the banana shrub on a warm spring night can be a very magical experience. Banana shrub is native to China and was introduced to the United States in the 1700s. 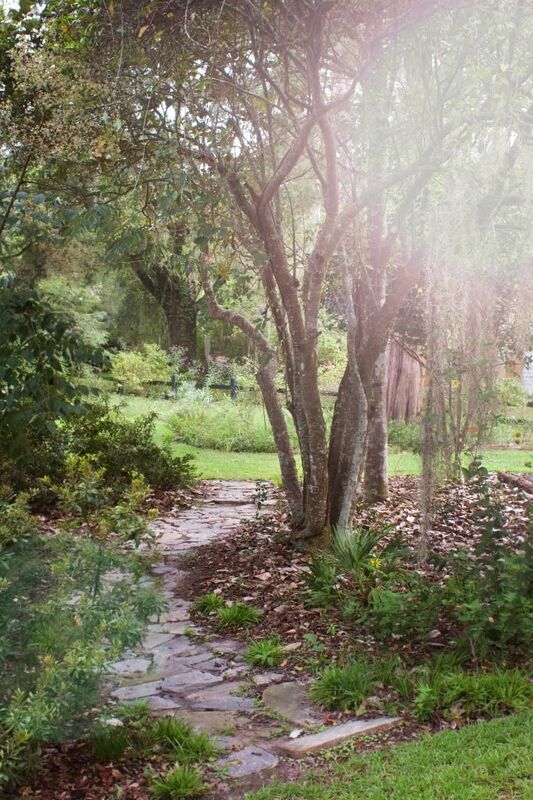 It’s one of the signature garden plants of Old Florida. I see banana shrubs all the time in Quincy, especially in the gardens in the historic district. They are generally grown to tree size and cloaked in moss. 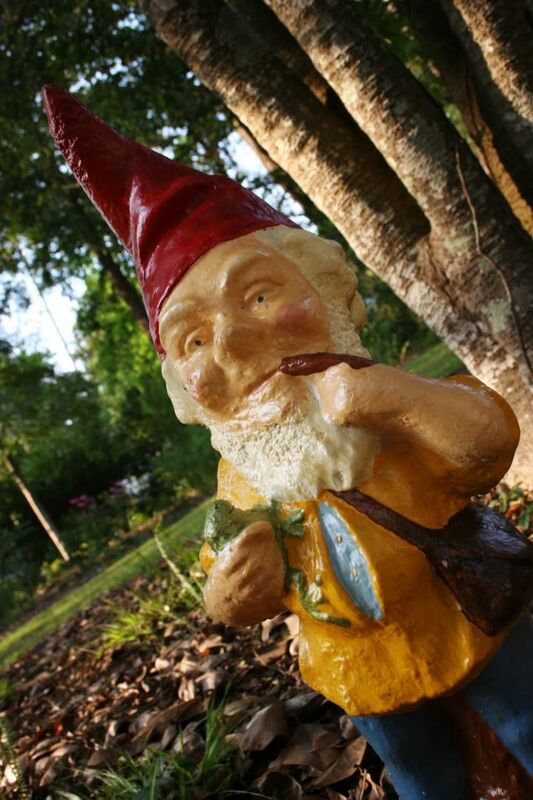 That's the banana shrub again, behind the gnome. I often pose people (and gnomes) in front of it for pictures. Here in central Florida, we have kept one of these in a large container for several years. It has developed a short thick trunk with multiple upright branches. It looks more like a bonsai version. The banana smell is fantastic in the spring. We get a few whiffs throughout the summer. Thanks for sharing the photos and the info! Neat. I always admire people who can grow plants in containers. I think that requires real skill and devotion! 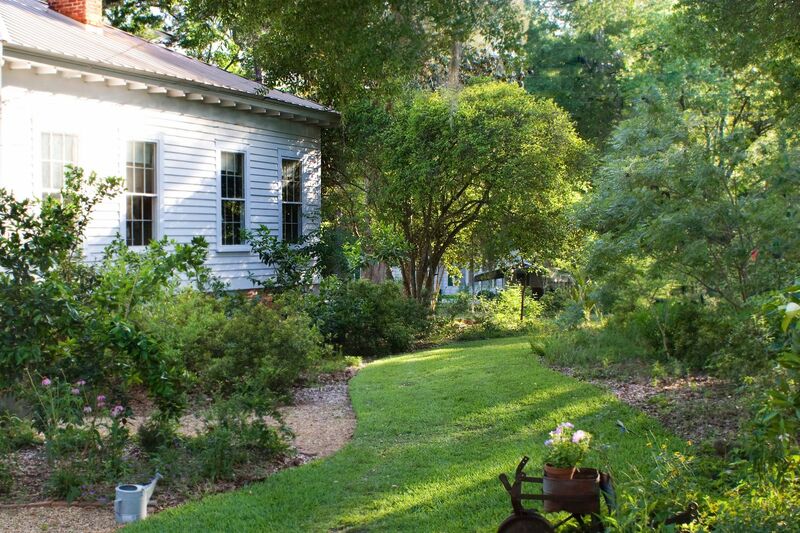 Hey Leslie...Do you know that I have gardened in Florida for almost 30 years and I just heard about the banana shrub about 2 years ago on another blogger's blog. I then happened upon one for sale at Bok Gardens and quickly purchased it. These plants are not well known in the central part of the state. I also did not know that it grows into a nice small tree...thought it would be a large bush, but I'm glad to hear that because I really like the smell and the plant is nice, too. Thanks for the info. The banana shrub is such a great plant. I'm so glad you got one!